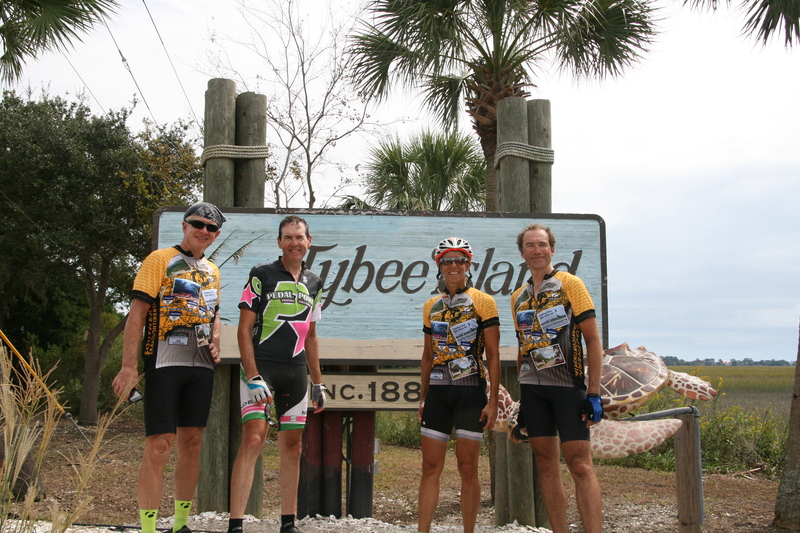 By now, you know that we finished our ride at Tybee Island. I had expected a ride like the ceremonial entry into Paris at the end of the Tour de France, but it was still over 85 miles of riding on busy roads! We left early, before dawn, and there were few real challenges other than an unexpected road closure, and a police officer’s vague detour instructions (admittedly, he was kind of busy) which added about four miles. In general, though, we were like horses that could smell the stable and the speed kept increasing as we got closer to the end. We were going at a good clip by the time we passed under I-95 on the western edge of Savannah, and by the time we hit the causeways out to Tybee Island it was practically a sprint. Neither my legs nor lungs complained! We were scheduled to “meet up” at the entrance to Tybee Island, and as I crested the causeway bridge I saw Kathy’s red car parked with the bike tour trailers. That was my first emotional moment of the day. I introduced her to my new bike friends and we all took pictures before the slow group ride to the ocean. My second emotional moment came when I saw the Atlantic, our goal for so very long. I knew the ride was over because, quite simply, we had run out of land to ride on! Many beachgoers a were surprised by thirty or so cyclists carrying their bikes to the ocean, but many eventually joined our celebration and helped take pictures. It will take a while for the impact of this trip to fully settle in, but today it’s enough that I achieved my goal of riding from the Pacific to the Atlantic in a fairly short 27 days. No rest days, and I never got in the van, I pedaled every inch! 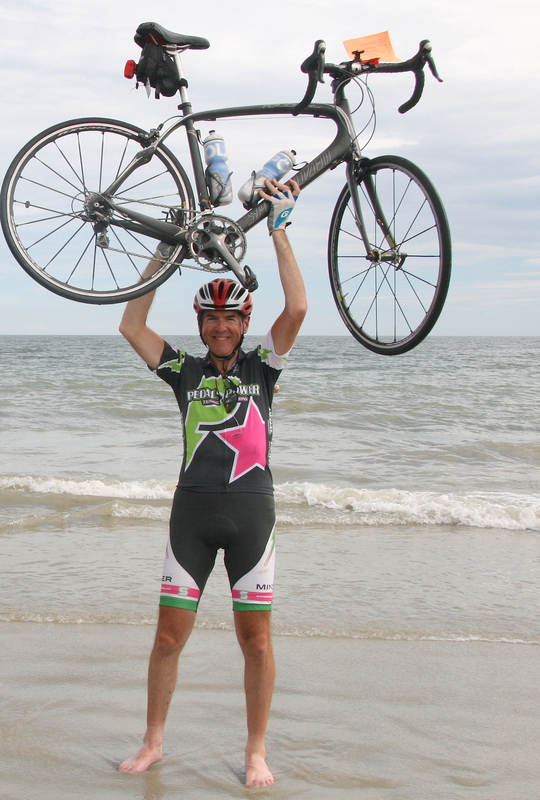 The conclusion to draw from all this, I think, is not what a wonderful, elite cyclist I am. Quite the opposite: the right conclusion is that I’m an average, amateur cyclist who managed to raise the odds enough through training to achieve something that sounded impossible. 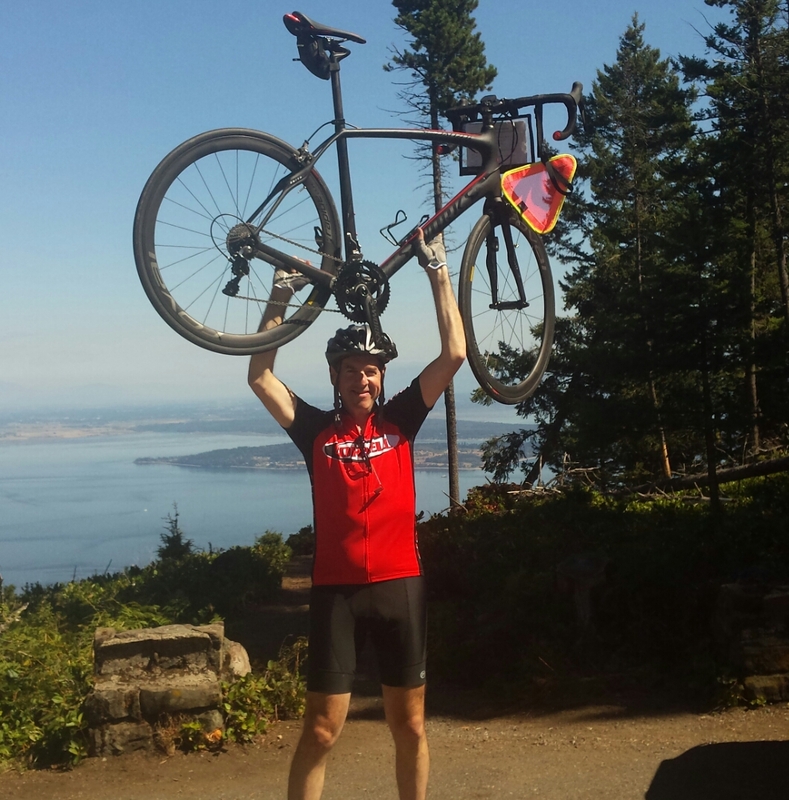 I could not have made it with out the support and comments from my friends, co-workers, and family (Kathy was the behind-the-scenes blog poster), and the training advice from Sarah Bresnick at Pedal Power Training Solutions. Thank you all so much! 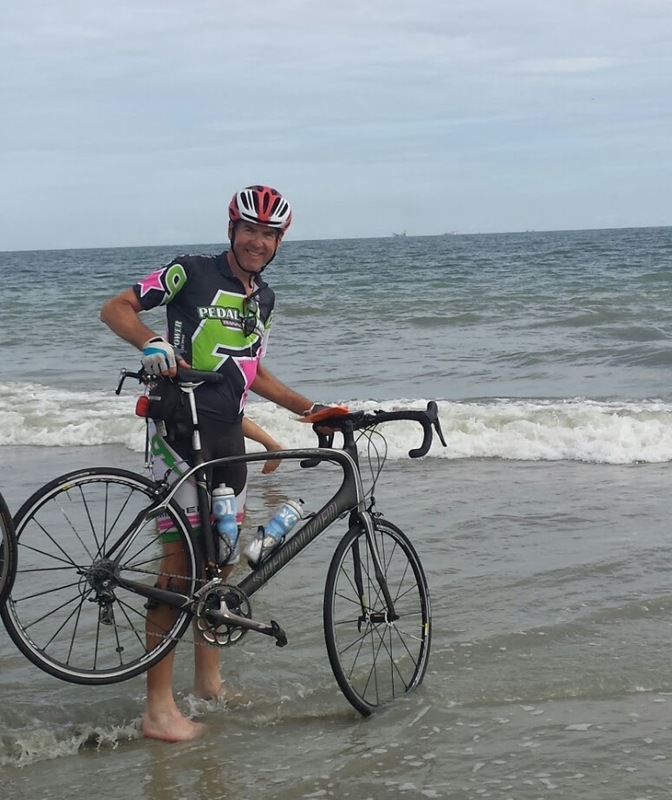 Today’s ride was 89 miles, and we reached the Atlantic and the end of our journey. Our hearty congratulations to you for the trip/achievement of a lifetime! Thank you so much for taking us along with you. We enjoyed your recounts of the days, miles, and history of the small remote towns you traveled through. What a way to experience the flavor of some of these places. We look forward to your return! I am sure the fall foliage and some well deserved apple pie will be a welcome reminder of home. Cheers to you and get some rest!